My name is Hilary and I am the owner of Pampered Pets. 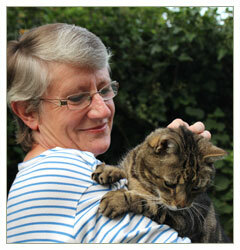 With over 20 years experience, I am a dedicated cat carer and owner and I welcome you to my business. Pampered Pets specialise in looking after cats in their own home because this is preferable to the trauma endured when a cat is sent to stay in a cattery. Many of our clients value text updates about the welfare of their cat while they are away. We guarantee to give your cat all the love and care it needs in its own home. We will visit your pet once or twice a day to feed, change their water and clean the litter tray. More than that, we will offer your cat strokes, brushes and love. Why not ask us to come and meet you and your cat and we can discuss the service we can offer you, particularly as our prices are often lower than a cattery! Pampered Pets is a privately run business covering the Surrey areas of Kingston, Richmond, Ham and parts of Surbiton. We are not a franchise - the business is run solely by myself. For your peace of mind we are fully insured with both public liability (including your cats) and product damage insurance backed by Cliverton, the leading pet sitting insurance company in the UK. Using our Pet Sitting service means that you are able to go on that holiday or business trip, safe in the knowledge that I, personally, will be caring for your pets.